9.2 Physiotherapy prescribers have undertaken an additional qualification to their degree and are restricted to prescribing within their clinical speciality. 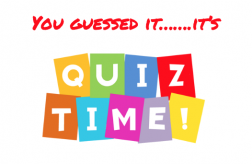 11.1 Have a go at this last quiz to see how much you understood about the treatments and therapies available as adjuncts and alternatives to polypharmacy in conjunction with deprescription. 13 Thank you for taking the time to read this Physiopedia resource discussing the emerging role for physiotherapists in tackling overprescription. Reflect on your own practice experience and clinical knowledge to consider the relevance of the information within your own field of work. Continuing Professional Development will offer supplementary links to further your understanding on a given topic through current evidence based journal articles. Take quizzes to consolidate your learning and maybe challenge coworkers to teach those around you. This resource is intended for qualified physiotherapists and pre-reg student physiotherapists who are interested in recognizing clinical circumstances of overprescription and further educating themselves on the potential role that could play is addressing this growing issue. All other allied health professionals, academics or individuals interested in the topic are also welcome. Before beginning your learning from this wiki, please find a short light-hearted video highlighting the topic in a fun, easy-to-follow manner at the end of this resource. You may watch it now or consolidate your learning at the end. The choice is yours. According to current health projections, due to an increasingly ageing population, the prevalence of multi-morbidity in the UK is predicted to rise significantly . Multi-morbidity can be described as the presence of two or more chronic medical conditions in an individual . Over the next twenty years, the prevalence of multi-morbidity is predicted to increase by 26% in the 65-74 age group, 64.5% in the 75-84 age group and 211% in the 85+ age group . With each morbidity or disease, there are different recommendations for treatment medications in accordance with disease-specific guidelines. Whilst guidelines are readily available, they are very much tailored to be disease-specific. The guidelines do not modify or consider the applicability for patients taking medications for multi-morbidity, where adhering to guidelines for each and every drug will inevitably lead to overconsumption of medications . This over consumption of medications is commonly known as ‘Polypharmacy’. Despite the topical use of the term polypharmacy to describe the use of multiple medications, a clear definition is still lacking. Some authors define polypharmacy as taking more than five medications , whilst others define polypharmacy as taking medication which lacks an indication, is ineffective, or duplicating the treatment offered by another medication . The term polypharmacy itself should not be used as a universal term, but instead be considered as either ‘Appropriate’ or ‘Problematic’ polypharmacy. Appropriate polypharmacy are medicines which, when prescribed according to best evidence, can extend life expectancy and improve quality of life, by treating a specific condition or illness. However, problematic polypharmacy is the inappropriate prescribing of multiple medicines, or where the intended benefit of the medicines are not realized . According to research, problematic polypharmacy increases the risk of interactions and adverse drug events (ADEs) as well as affecting patient compliance and quality of life . 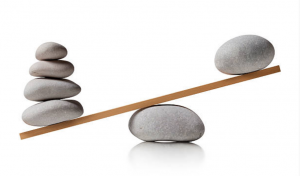 This lack of clarity reflects the difficulty in setting an accurate cut-off point for not only when polypharmacy begins, but also at which point polypharmacy becomes problematic. According to a review of , the most common point at which polypharmacy is considered to begin is the use of more than five medications . If applying the cut-off point outlined by , research highlights that in certain settings, between twenty-five and fifty percent of all patients aged seventy-five or older are exposed to polypharmacy on a daily basis . Factors such as patient age, updated medication treatment criteria, cross-activity, interference and effect on metabolism should be considered when trying to determine if the patient’s polypharmacy is appropriate or problematic . Problematic polypharmacy is generally seen as the result of a cascade of prescribing . This cascade is often initiated when an adverse drug effect is misinterpreted as a new medical problem, leading to the prescribing of more medication to treat the initial drug-induced symptom(s). Potentially inappropriate medications (PIMs) (medications which should be avoided in older adults and those with certain health conditions), are also increasingly probable to be prescribed in the setting of problematic polypharmacy . Means to addressing problematic polypharmacy has long been a topic of interest, and according to Moriarty et al. (2017), the majority of consequences of problematic polypharmacy can be minimized or even prevented by using a patient-centered, structured process with planning, tapering and close monitoring during, and after medication withdrawal. According to literature, this process is known as Deprescribing . Deprescribing is defined as the process of withdrawal (and/or dose reduction) of inappropriate medications supervised by a health care professional . 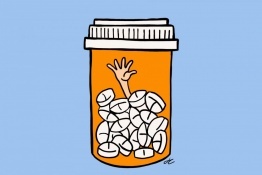 The term “Deprescribing” first appeared in literature in 2003 . The term has become more widespread in recent years, with literature recommending that the term Deprescribing should be internationally adopted in order to create a universal understanding, both in research and practice, of this specific concept of medication withdrawal or reduction . The following videos provides an easy to follow in-depth discussion regarding the concept. With increasing concern about the negative effects of overuse of medications, there in growing attention being paid to approaches which can minimize harm and promote healthy wellbeing. Focus is shifting from prescribing, which is the starting or renewing of medications, toward this concept of Deprescribing, especially within an ageing population . It is very important to note that Deprescribing is very different to non-adherence or non-compliance. Desprescription involves health care professional direction and supervision with the same level of expertise and attention that prescribing entails . As well as the misinterpretation of symptoms discussed previous, whilst medications may be prescribed and initiated for an appropriate reason, potential insufficient monitoring, follow-up, and transfer between providers and care settings may contribute to medications being continued indefinitely and inappropriately . According to research, there are high levels of inappropriate medication use in older adults across a variety of settings and countries, proposing that there are currently vast unrealized opportunities of deprescribing . As well as opportunity, research suggests there is a desire for this desire for this concept of deprecribing to be introduced. Despite a moderate agreement in the specific medicines to deprescribe, a study by Page et al. (2016) found that both physicians and pharmacists in the study had ‘substantial’ agreement that desprecribing is beneficial for the patient . As well as Health Professionals, research suggests that older individuals themselves are “eager” to undertake deprescribing . The authors’ suggested that this desire was linked to the individuals’ feeling of taking a large number of medications and with the belief that some of the medications were no longer necessary . Take a moment to complete this short quiz to to see how much you've learned about polypharmacy in our current health care system and society. The authors of this resource are students of Physiotherapy, and not Supplementary Prescribers (SPs) or Independent Prescribers (IPs). Therefore the discussion of the role of the Physiotherapist in supplementing alternative and complimentary options to polypharmacy will be approached whilst considering our scope of practice. As an emerging role, the role played by the Physiotherapist in Deprescribing has previously not been examined, to the knowledge of the authors. Therefore, this resource aims to investigate the potential role the Physiotherapist can play in this growing concept. Available literature linking physiotherapy with deprescribing has focused only on the role of physiotherapy as a supplementary treatment for pain relief when reducing opioid dosage. Research  suggest that patients in severe pain, despite use of high-dose opioids, may experience significant improvement in pain severity, functioning, and mood when their opioid is tapered to a lower, safer dose. In this research, opioid-dose reduction was supplemented by interdisciplinary rehabilitation programs, including physiotherapy, cognitive behavioural therapy and occupational therapy, which showed long-term improvements in pain, functioning and emotional health . There was no distinction of which individual treatment modality was most effective however these studies highlight the potential for a multi-disciplinary approach to deprescription. In addition, guidelines for opioid use recommend that patients with long term complex pain should have their opioid dosage regularly reviewed, with removal or reduction of opioids supplemented with non-opioid analgesics or non-drug treatments such as physiotherapy, where appropriate . This resource aims to bridge a gap in literature by investigating the potential role the Physiotherapist can play in the deprescribing process itself. Have you ever considered the potential role for allied health professionals in deprescription? If so, how did you envision it? As well as identification of polypharmacy, there are other roles to share in the deprescription process . Literature suggest that the following elements are fundamental in the process of Deprescribing . Whilst the elements are easily classifiable, the specific profession of the multidisciplinary team responsible for each is not as easily distinguished. Instead, much of the available literature recommends sharing the process. Shared, informed decision making is crucial to delivering patient-centered care, and it is just as important to delivering Deprecription . While some patients evidently may still seek recommendation from their physician, or seek their physician to make decisions regarding medication , shared multidisciplinary decision making can still occur through discussion of options, benefits, harms and consideration of patient preferences . When Deprescribing medication(s), patients’ should be provided with sufficient knowledge of the decision to be made, have realistic expectations for outcomes and be confident in their decision . Members of the multidisciplinary team are ideally located to play a part in this process. As well as physicians, general practitioners (GPs), nurses, medical specialists and pharmacist have all been highlighted in the literature to being involved in leading or contributing to deprescribing efforts. Research indicates that multidisciplinary interventions are generally the most effective at reducing polypharmacy and inappropriate medication use . Research recommends that pharmacists and nurses be involved in the deprescribing process in practice. The author suggests that patients are generally more comfortable with the involvement of a pharmacist or nurse in the process of deprescribing . Evidence suggests that patients are more willing to have a medication deprescribed if it is recommended by a health professional whom they have a relationship with . The health professionals elucidated in the studies were physicians, GPs and medical specialists. Furthermore, research suggest that interventions with close involvement of the local GP are more likely to be successful in achieving deprescribing than those which are conducted by an external research team . When considering the avenue of GP desprecribing, it must be noted that the primary care setting provides access to prescription history and medical records and provides opportunity for monitoring after discontinuation, which the GP cannot offer. Evidence recommends that effective communication between GP’s and specialists with access to this information may serve as a viable solution to this issue . Regardless of specific elements or mechanical tasks in the Deprescribing process, it is clear from the evidence that sharing the process amongst the multidisciplinary team provides the greatest platform for success. In a one year review of the “hot topic” deprescribing, Barnett and Garfinkel. (2018) discuss that we have now reached a point of awareness of the ‘epidemic’ of polypharmacy and its consequences. According to the authors, this is only the first key step. They suggest that it is now time to take the second step of international action to manage the challenge. The authors recommend that deprescribing in preventative and curative care must be addressed through education by sharing the process amongst the multidisciplinary team, including doctors, pharmacists, nurses, health policy makers, and now, even physiotherapists . The following sections will provide in-depth discussion regarding the potential roles that the Physiotherapist could play in this deprescribing process. This next section highlights the relevant evidence both in support of and against the potential for deprescription as a treatment option from the patient and AHP perspective. 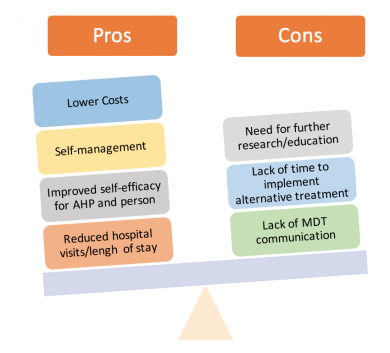 Figure two represents a summary of the pros and cons of deprescription from the AHP perspective. 92% of older adults are hypothetically willing to decrease the amount of medication they are taking. One concern is this “willingness” may not transfer to real life when it comes to actually implementing deprescription . Patients are presently more willing to try deprescription if their doctor is the one to suggest it or if it comes from another medical practitioner they have a strong relationship with . This could be a role for physiotherapists in the future if we change how patients’ view the various role differences in allied health professionals. Patients’ concerns with deprescribing are: not believing it’s appropriate for them and fear related to withdrawal. This could be addressed with effective communication that educates the patient on the appropriateness of deprescribing. Patients want to understand their medication better, and an increase in their knowledge on medication could help resolve some adverse reactions from occurring and improve patient adherence. Following pharmacist led medication reviews, patients found they understood more, were content with decisions and overall felt like they had a better quality of life. In areas where healthcare is not free, patients felt that if they didn’t need to be on numerous medications or potentially no medications, there would be less out of pocket costs. Kalogianis et al. (2016) found 14.7% of people in residential aged care facilities within Australia, stated that paying less for medication would positively affect their willingness to try deprescription. Looking back on the individuals you've worked with, can you think of anyone that would have been keen to explore the potential of reducing their prescription or some that would have resisted out of concern? It has been PROVEN polypharmacy has NEGATIVE health benefits such as: decreased quality of life, adverse drug reactions, increased fall occurrence, hospitalization, mortality and non-adherence Olsson et al. 2011; Jyrkka et al. 2012; Maher et al. 2014; Wallace et al. 2017). Passarelli et al. (2005) found inappropriate medications doubled a patient’s chance of adverse reactions. Antiplatelet drugs, insulin, warfarin and hypoglycemics have been found to be a cause of 2/3 of adverse drug reactions in hospitals. Polpharmacy burdens healthcare providers by the constant rise in demand for medical administration, which limits the staff’s time for provision of non-pharmacological care . Unfortunately, it is suggested that fragmented healthcare systems are barriers to multi-disciplinary team communication in the implementation of deprescription . Negative consequences include exacerbation of underlying diseases and drug withdrawal symptoms. Adverse drug withdrawal events can occur (ex. insomnia when decreasing benzodiazepines or rebound heartburn when stopping protein pump inhibitors), but serious harm is rare. Numerous studies have proven to lower costs in healthcare in relation to deprescription . The funding saved from deprescription can then be used on other interventions . Estimated savings of $716.46 US per participant on a generic statin can be achieved when the drug is removed. Follow-up on their study showed that most participants remained off the drug. Proven clinical outcomes with deprescription have also been displayed in patients with diabetes and high blood pressure, which resulted in better cholesterol control and overall medication management. When reviewing individualized withdrawal of inappropriate medications, it was found that only 2-18% of patients actually restart medication due to reoccurrence of the condition or symptoms. 14-64% of patients successfully discontinued their proton pump inhibitors, 25-85% of patients discontinued benzodiasepines, but when discontinuing antihypertensive medication 15-80% of patient restarted medication before the end of the study . This emphasizes the need to review the appropriateness of which drugs are most tolerated when deprescribed, but it is promising for future outcomes in deprescription. By simply removing unnecessary or inappropriate patient medication in palliative care could offer public health benefits. In the US, 177,504 emergency hospital visits during 2004-2005 occurred by adverse drug reactions in adults over age of 65. Australia = 30% unplanned hospital visits are from patients over 75 year old and ¾ of them are preventable. Positive effects include: reduction of inappropriate drug use, overall medication numbers, decreased hospital lengths of stay, general health improvement and limits the decline in a patient’s quality of life. When it comes to implementing deprescription, healthcare providers may be undecided which medications should be decreased or removed. Algorithms such as Figure (1) in the following section were introduced to help target this issue. The implementation of decision-making guidelines for deprescription has increased healthcare professionals’ overall self-efficacy in the process . 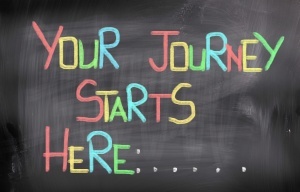 Click on the following link to see how much you've learned! In order to have an understanding of the role of deprescription, physiotherapists must have an understanding of their current role and scope of practice with regards to prescribing medication. Currently there are two types of prescribers physiotherapists can be, this will be described below. Physiotherapy prescribers have undertaken an additional qualification to their degree and are restricted to prescribing within their clinical speciality. The supplementary prescriber works in partnership with a doctor or dentist to prescribe the medicines needed by an individual patient for the management of their condition using a written document called a Clinical Management Plan (CMP). The names of the medicines permitted to be prescribed must be listed in a written Clinical Management Plan that is created before prescribing occurs. Although this means that there is no restriction in what medication can be prescribed the ultimate decision and responsibility in deciding on the medication lies with the doctor . Being an independent prescriber allows a physiotherapist to autonomously prescribe, as well as supply and administer medicines appropriate to the needs of the named patient. As well as prescribing medication independent prescribers can alter doses, cease to prescribe a medication and withdraw a medication. This must be within the restrictions as stated above and be thoroughly discussed with the patient. When withdrawing a medication a plan must be put in place that has been agreed in partnership with the patient . 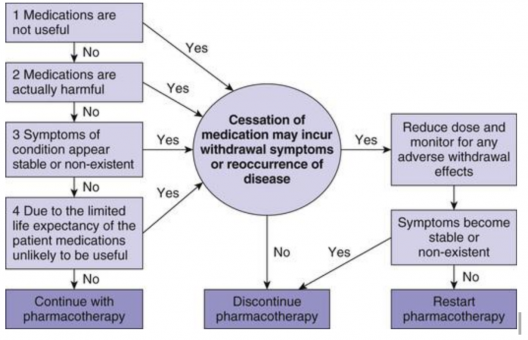 If considering the benefit of ceasing or “deprescribing” a medication it may be useful to consider the protocol in Figure(2) to justify the changes. This may also apply to supplementary prescribers relaying information back to the doctor. Elimination – how the drug is excreted and eliminated from the body. The legal frameworks surrounding medicine. Know where appropriate information regarding the medication can be obtained- in particular signposting the patient to inside the medication packet where the summary of product characteristics can be found. General advice that can apply to the whole population may be given on the effects of medication. For example the general side effects of non-steroidal anti-inflammatory drugs (NSAIDs). While providing advice it should also be recommended that the patient should seek advice from a pharmacist or independent prescriber before altering any medication they currently take. 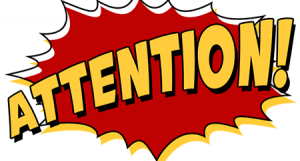 Please note: non-prescriber physiotherapists CANNOT provide specific advice on prescription-only medication. Physiotherapists can recommend patients to go and seek a specific medication from their GP. ONLY IF the physiotherapists have substantial knowledge of the prescription only medication, the evidence base behind it and is working with that particular relevant patient group. If the medication is advised it MUST be followed up with the recommendation that it must be discussed with their GP . If a non-prescriber physiotherapist notices a patient is not taking their medication correctly, they can refer the patient to the medications instructions and remind them how and when/ dose they should be taking their medication as prescribed. This can also apply to medication devices, e.g. an inhaler, advice can be given how to use it according to guidelines. Expected adverse effects of medication? What non-prescribers can do: Physiotherapists can refer the patient back to the GP/pharmacists or can contact the GP directly providing information on their concerns. When deciding whether a medication or combination of medications are may be harmful, the professional must consider . Furthermore, they can report the adverse drug reaction (ADR) to Yellow Card Centre Scotland. This system collects all reported adverse drug reactions and assesses whether a certain drug may negatively interact with others, if it doesn't agree with a certain population or if it may need to be recalled. 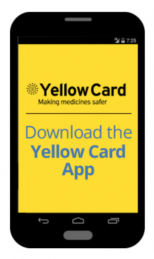 The scheme aims to improve the safety of medication and it is the responsibility of doctors (working in hospital and primary care), pharmacists (working in hospital and the community), nurses, and HCPs (including physiotherapists) to report any adverse reactions. This can be done online, via an App or post . HCPs in particular should be aware of a upside down black triangle on a medication packet. It means it is the first licensed use of the medication and may not have been exposed to a large number of patients. Therefore, are encouraged to report all suspected ADR which occur with medication with a black triangle regardless of the severity of the reaction. It can be seen that the CSP guidelines for non-prescriber physiotherapists are slightly vague as they are dependent on an individual’s personal knowledge and level of experience. In a study by Braund and Abbott it was reported that a large number of non-prescriber musculoskeletal physiotherapists practice outwith their scope by recommending a dose or a brand of non-steroidal anti-inflammatory drugs (NSAIDs) to patients. Furthermore, just over 70% were able to name side effects of NSAIDs as gastrointestinal upset, ulcers or bleeding, while only 30% were able to name respiratory, renal or allergic risks. NSAIDs in particular are one of the most common medications physiotherapists are asked questions about. It has been reported that physiotherapists feel pressured into answering questions regarding this medication, yet feel they are inadequate to do so . The evidence indicates physiotherapists should have a better understanding of their scope of practice. As well as having a greater knowledge of commonly prescribed medication, including side effects as shown in the tables below. Furthermore, with polypharmacy becoming more prevalent it is important for all HCP to be aware of drug interactions to pick up on potential or happening ADR . How confident are you in your understanding of common prescriptions, side-effects and interaction? Have a discussion with your physiotherapy or MDT team to consider everyone's perspective towards the role of physiotherapists within this scope of practice. Is it appropriate? Is it safe? Does using a holistic approach to deprescription dilute the safety and efficacy of current pharmaceutical practices? Table (1) illustrates a limitedlist of the commonly prescribed medications physiotherapists may encounter with their patients, and the side effects that can occur as a result. It is important that physiotherapists are aware of these, and other common medication side effects to be able to identify these issues as they arise. Table (2) demonstrates a limited list of medications that are “multi-purposeful”, meaning they can target and treat more than one issue. It is important to be aware of these medications and not to assume the patient has been prescribed the medication for the most common reason. It is also valuable to be aware of these medications for if a patient has more than one complication, it may be possible to suggest prescription of 1 medication to treat both issues, rather than 2 medications with 2 possible lists of side effects. Table (3) illustrates medications that are highly correlated with falls. If a patient is becoming greatly affected by this falls side effect and is subsequently jeopardising their safety, cessation or alteration of dose may be proposed. As a non-prescriber, this can be discussed with the patient’s GP who has the authority to make such changes. Physiotherapy interventions can be suggested in conjunction with the medication alteration to target the falls risk, or as a substitute to the purpose of the medication. The more medications a patient takes, the risk is increased of the drugs interacting with each other . Drug interactions are not just limited to drug-drug interactions. Certain drugs can have negative interactions with food, beverages and supplements also. A well known example of this is alcohol. As an independent prescriber, supplementary prescriber or non-prescriber physiotherapist, it is important to be aware of medications that can negative interactions with each other. Some patients may be on prescription medication and when feeling unwell visit their local pharmacy to purchase OTC medications, which unknowingly to them, may not be recommended in conjunction with their prescribed medication. Click on the following link to see how much you've learned about common medications, ways in which drugs are repurposed, the presentation of adverse drug interactions and side effects! The use of multiple drugs is not always an indicator of poor drug treatment or overmedication. Appropriate medication depends on whether or not the advantages outweigh the disadvantages which is subjective to both the individual and their given condition(s). It can be very hard to predict the side-effects or clinical effects of a drug combination without testing it on the specific individual as the effects all very based on the individual's genome-specific pharmocokinetics. As a result of improvements in health care services and modern technology, the aging baby-boomer generation has a longer life-expectancy than previous generations. However, the risk of multiple chronic diseases increases with age requiring multiple medications. Various studies have shown that on average, older adults are consuming 2-9 medication per day with a shocking prevalence of inappropriate medication use of 11.5-62.5%. Elderly populations are specifically at risk of adverse drug reactions (ADR) as a result of age related changes such as increased medication sensitivity, slower-metabolism and slower drug elimination. There appears to be a virtually linear relationship between the occurrence of ADRs with every drug taken as well as a cumulative potential for adverse side-effects. What is more concerning is the fact that signs of polypharmacy are often masked as usual signs and symptoms of aging including: tiredness, decreased alertness, constipation, diarrhea, incontinence, lack of appetite, confusion, depression or lack of interest in usual activities, weakness, visual or auditory hallucinations, anxiety, dizziness. Polypharmacy in elderly populations can also lead to poor quality of life, increase the risk of falls and poor compliance with medication. The concept of a "pill burden" is recognized as having so many different drugs or pills to take on a regular basis that it can be challenging to organize, store, consume, let alone understand their purpose or appropriate regimes. In turn, "pill burden" increases the risk of hospitalization, medication errors, and has negative effects of healthcare outcomes and costs. Reconsidering this population's prescription on a regular basis is important to maximize their quality of life throughout their remaining years. The relief achieved from reducing their medication load may potentially lead to better outcomes. Special attention may also be needed towards those considered to have frailty, the clinically recognized state of increased vulnerability, as they are even less resistant to adversity and not considered as a separate entity in most clinical guidelines. Psychiatric disorders are complex our understanding of these conditions remains inadequate. Although the complexity of illnesses such as schizophrenia may understandably require a polypharmaceutical approach, Tamminga et al. (2011) believes "it is incumbent upon us to step forward and test these assumptions so that validated combination treatments are demonstrated to enhance therapeutic outcomes and not only ameliorate side effects." There is insufficient and conflicting evidence regarding the benefit or detriment of polypharmacy emphasizing its subjectivity and need for further research. Polypharmacy may be recommended to treat adverse effects of the primary drug, the provide acute improvements while waiting for delayed effects of another prescription, to boost the effectiveness of a primary drug or to treat intervening illnesses such as depression during the course of their schizophrenia however, due to the lack of research in the demerits of drug combinations and increased risk of adverse drug to drug interactions, special attention must be paid towards education, proper screening, and further research. COPD places a significant burden on the health care system in the UK as it is the second most common pulmonary disease in the UK and is a prevalent condition in individuals with multimorbidity. Those affected by COPD are significantly more likely to be diagnosed with a range of cardiovascular comorbidities than those without. COPD is also found to be related to long term conditions such as obesity, depression, gasto-oesophageal, osteoporosis and lung cancer. Over half of COPD patients in the UK Biobank reported polypharmacy of more than 5 medications and 15% reported more than 10 medications as a result of co-existing conditions. Considering the increasing prevalence of co-morbidity around the world and more so with age, populations with COPD should be considered at risk of polypharmacy and potential over-prescription yet further guidelines to protect them against this risk are necessary. Individuals with moderate to severe COPD with a high risk of exacerbation are recommended to use bronchodilators and inhales corticosteroids (ICS) in combination. Long and short acting bronchodilators as well as other therapies such as long-acting theophylline, acetylcysteine, azithromycin, influenza and pneumococcal vaccines, and roflumilasts have been found to reduce exacerbations and improve quality of life in COPD populations however recent evidence highlights inaccuracies in prescription accuracy according to the publishes GOLD guidelines. In addition there appears to be a lack of understanding on which of the multiple medications patients should be taking to improve their clinical response which might further be complicated by other long-term conditions. Not only does this increase the risk of over-prescription but COPD taking ICS and bronchodilators over the long term are found to have increased the risk of pneumonia, and fractures. Experimenting with the combination of these expensive medications can impose a financial burden on both the health care system and the individual. Although this issue requires further research to develop clearly defined guidelines similar to treating patients with hypertension, COPD populations should be monitored for inappropriate medication combination, over-prescription and the relevant side effects. The use of non-pharmacological options in tackling overprescription should be considered across all allied health professionals. For physiotherapists, the vast majority of interventions utilized in practice are non-pharmacological as most clinicians are non-prescribers. It is important for physiotherapists and other relevant health care providers to be aware of the wide array of treatment options for sufficient provision of holistic patient care, to be used on their own or in conjunction with drug therapies, in effort to address clinical scenarios where overprescription may be an issue. The most common treatment for chronic pain is traditionally pharmacological. Health care professionals should be aware of the benefits of non-pharmacological options with sufficient evidence bases for a range of relevant domains such as improvements in pain and functional status, as well as cognitive and emotional states. A recent 2017 study has discovered barriers to non-pharmacological options with regards to chronic pain. Top ranked patient-reported barriers included high cost, transportation problems, and low motivation. While top provider-reported barriers include scepticism about efficacy of the non-pharmacological options. For this reason, the authors of this Physiopedia page have constructed a non-exhaustive list of common Non-Pharmacological Approaches, accompanied with descriptions and mechanisms of the interventions, brief summary of the evidence base, and suggestions for referrals and signposting patients for options outside the scope of physiotherapy. Some of these options listed are covered under the National Health Service, others can be used for self-management, and some address beliefs and cognitive effects. Therefore, this resource should be used in hopes to address the high cost, transportation, and low motivation barriers of patients, while providing a brief population dependent evidence base for a wide array of non-pharmacological options so healthcare providers can be confident in their choice of treatment option in accordance with the individual values of their patient. The decision to seek non-pharmacological options outside conventional care, should be discussed with a patient’s general practitioner or wider multidisciplinary team, and include patient preferences and values, in order to provide safe and optimal patient-centred care. 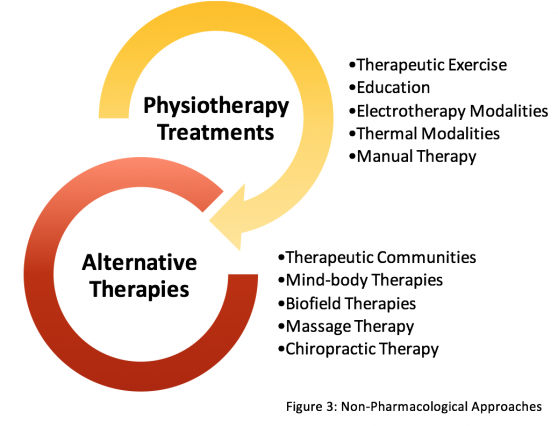 Non-Pharmacological approaches are listed for both inside and outside the scope of physiotherapy (Figure 3). Have a go at this last quiz to see how much you understood about the treatments and therapies available as adjuncts and alternatives to polypharmacy in conjunction with deprescription. Read through the latest issue of The King's Fund regarding the role of changes in the NHS. Reflect with yourself or your AHP team about how your current practice reflects these proposed changes and suggestions you may have on ways to improve the value of the NHS. Douglas is a 78 year old man who resides in at Drummond Grange nursing facility. Approximately 11 months ago, he fell and fractured his right hip and underwent surgery. Immediately after the surgery, Douglas was prescribed Warfarin to prevent deep vein thrombosis (DVT) after surgery. He returned to the nursing home, completed rehabilitation with the on site physiotherapist, and regained most of his prior function, however, he currently expresses a fear of falling. Douglas has a previous history of falls, luckily none have caused any significant injury until now. 2 months ago, Douglas saw his GP as he had a painful right shoulder. The doctor suggested he take 400mg of NSAIDs every 4-6 hours as necessary to relieve the pain. During a routine physiotherapy assessment, you notice Douglas is not only still being administered Warfarin but he also reports to be taking his NSAID prescription on a regular basis every since that doctor appointment. After further investigation, it is discovered that the Warfarin was never discontinued after the appropriate duration after the hip fracture repair. Regardless of the progress Douglas has made in his hip strength and function, Douglas still appears to be struggling with his balance and fatigue. As a non-prescribing physiotherapist, adjusting his prescription may be out of your scope of practice. However, you are aware of the adverse drug interactions that can occur between NSAIDs and Warfarin. What is the purpose of Warfarin? What is the purpose of NSAIDs? Is this an adverse drug reaction that could be eligible to be reported to Yellow Card? Who should you address regarding your concerns? As a non-prescribing physiotherapist, which of the following are the best approaches to this scenario? Tell Douglas to stop taking NSAIDs and Warfarin to reduce all risk of adverse drug interaction. Tell Douglas to reduce his doses of NSAIDs and Warfarin to reduce the risk of adverse drug interaction. As a non-prescribing physiotherapist, what alternative treatments would you implement to better support Douglas and his increased risk of fall/sore shoulder? Douglas’ case is an example of using the right drug but not using it for the correct duration. After orthopedic surgery, Warfarin is usually appropriate for approximately two to three months or until activity/ambulation has increased to a point that the risk of DVT is reduced. In conjunction with this, NSAIDs and Warfarin together introduces a negative drug interaction which increases the risk of bleeding. As Douglas already has a history of falls, he has increased potential of excessive bleeding if he was to fall again. Within this care home environment, and within clinic there is a shared responsibility for allowing these potentially harmful prescriptions to go unnoticed. Not only might the GP fail to realize that Douglas was still taking Warfarin but the nurses in the care home may have overlooked his ongoing consumption of NSAIDs. As a physiotherapist, it is essential that we understand these adverse drug interactions in order to recognize the risks in our patient’s drug history. Additionally, being confident in the next steps will help ensure you are staying within your scope of practice and supporting the patient’s safety. Discuss with MDT concerns about future falls and current prescriptions. Inquire about potential vision impairment, urinary incontinence, cognitive impairment, and adequate nutrition. As a non-prescribing physiotherapist, it is not within our scope of practice to tell a patient to stop taking or reduce their prescribed medications. However, we can highlight and discuss the urgent matter with the appropriate medical staff for further actions to be taken. This resource was created with the intention of raising awareness regarding the emerging role of tackling overprescription in physiotherapy practice. With the information provided on the current issue and the skills and knowledge required, we hope that you now feel equipped to work within your scope of practice to help identify and address common overprescription clinical scenarios. By being aware of the purpose and side effects of common medications, we can work within our MDTs to help reduce this growing problem, and even suggest potential physiotherapy interventions as an adjunct or replacements for certain medications. Thank you for taking the time to read this Physiopedia resource discussing the emerging role for physiotherapists in tackling overprescription. ↑ 1.0 1.1 Kingston A, Robinson L, Booth H, Knapp M, Jagger C. Projections of multi-morbidity in the older population in England to 2035: estimates from the Population Ageing and Care Simulation (PACSim) model. Age and ageing 2018;For the MODEM project:1-7. ↑ Wallace E, Salisbury C, Guthrie B, Lewis C, Fahey T, Smith S.M. Managing patients with multimorbidity in primary care. BMJ 2015;350:1-6. ↑ Sönnichsen A, Trampisch U.S, Rieckert A, Piccoliori G, Vögele A, Flamm M, Johansson T, Esmail A, Reeves D, Löffler C, Höck J, Klaassen-mielke R, Trampisch H.J, Kunnamo I. Polypharmacy in chronic diseases– Reduction of Inappropriate Medication and Adverse drug events in older populations by electronic Decision Support (PRIMA-eDS): study protocol for a randomized controlled trial. Trials 2016. ↑ 4.0 4.1 4.2 4.3 Bushardt R.L, Massey E.B, Simpson T.W, Ariail J.C, Simpson K.N. Polypharmacy: misleading, but manageable. Clinical Interventions in Aging 2008;3:383–389. ↑ 6.0 6.1 6.2 6.3 6.4 6.5 Reznik J, Keren O, Morris J, Biran I. Pharmacology Handbook for Physiotherapists. Australia: Elsevier; 2016. ↑ Banerjee, A, Mbamalu D, Ebrahimi S., Khan A.A, Chan, T.F. The prevalence of polypharmacy in elderly attenders to an emergency department – a problem with a need for an effective solution. International Journal of Emergency Medicine 2011;4. ↑ Junius-walker U, Theile G, Hummers-pradier E. Prevalence and predictors of polypharmacy among older primary care patients in Germany. Family Practice 2007;24. ↑ Sigurdardottir A.K, Arnadottir S.A, Gunnarsdottir E.D. Medication use among community-dwelling older Icelanders. Population-based study in urban and rural areas. Laeknabladid 2011;97:675–680. ↑ Slabaugh S.L, Maio V, Templin M, Abouzaid S. Prevalence and risk of polypharmacy among the elderly in an outpatient setting: a retrospective cohort study in the Emilia-Romagna region. Italy Drugs Aging 2010;27:1019–1028. ↑ Bourgeois F.T, Shannon M.W, Valim C, Mandl K.D. Adverse drug events in the outpatient setting: an 11-year national analysis. Pharmacoepidemiology and Drug Safety 2010;19:901-910. ↑ Nair N.P, Chalmers L, Peterson G.M, Bereznicki B.J, Castelino R.L, Bereznicki L.R. Hospitalization in older patients due to adverse drug reactions–the need for a prediction tool. Clinical Interventions in Aging 2016;11:497-506. ↑ Crenstil V, Ricks M.O, Xue Q.L, Fried L.P. A pharmacoepidemiologic study of community dwelling, disabled older women: factors associated with medication use. American Journal of Geriatric Pharmacology 2010;8:215–224. ↑ 15.0 15.1 Jyrkka J, Enlund H, Lavikainen P, Sulkava R, Hartikainen S. Association of polypharmacy with nutritional status, functional ability and cognitive capacity over a three-year period in an elderly population. Pharmacoepidemiology and Drug Safety 2010;20:514–522. ↑ Fletcher P.C, Berg K, Dalby D.M, Hirdes J.P. Risk factors for falling among community-based seniors. Journal of Patient Safety 2009;5:61–66. ↑ Espino D.V, Bazaldua O.V, Palmer R.F, Mouton C.P, Parchman M.L, Miles T.P, Markides K. Suboptimal medication use and mortality in an older adult community-based cohort: results from the Hispanic EPESE Study. The journals of gerontology. Series A, Biological sciences and medical sciences 2006;61:170-175. ↑ 20.0 20.1 20.2 Reeve E, Moriarty F, Nahas R, Turner J.P, O’Donnell L.K, Hilmer S.N. A narrative review of the safety concerns of deprescribing in older adults and strategies to mitigate potential harms. Expert Opinion on Drug Safety 2017. ↑ 21.0 21.1 21.2 21.3 21.4 Reeve E, Thompson W, Farrell B. Deprescribing: A narrative review of the evidence and practical recommendations for recognizing opportunities and taking action. European Journal of Internal Medicine.2017;38:3-11. ↑ Woodward M.C. Deprescribing: achieving better health outcomes for older people through reducing medications. Journal of Pharmacy Practice and Research 2003;33:323–328. ↑ Iyer S, Naganathan V, Mclachlan A.J, Le Couteur D.G. Medication Withdrawal Trials in People Aged 65 Years and Older. A Systematic Review. Drugs Aging 2008;25:1021-1031. ↑ Todd A, Husband A, Andrew I, Pearson, S.A, Lindsey L, Holmes H. Inappropriate prescribing of preventative medication in patients with life-limiting illness: a systematic review. BMJ Supportive & Palliative Care 2017;7: 113–121. ↑ 28.0 28.1 Sirois C, Oullet N, Reeve E. Community-dwelling older people’s attitudes towards deprescribing in Canada. Research in Social and Administrative Pharmacy 2017;13:864-870. ↑ 29.0 29.1 Townsend C.O, Kerkvliet J.L, Bruce B.K, Rome J.D, Hooten W.M, Luedtke C.A, Hodgson J.E. A longitudinal study of the efficacy of a comprehensive pain rehabilitation program with opioid withdrawal: Comparison of treatment outcomes based on opioid use status at admission. Pain 2008;140:177-189. ↑ 30.0 30.1 Huffman K.L, Sweis G.W, Gase A, Scheman J, Covington E.C. Opioid Use 12 Months Following Interdisciplinary Pain Rehabilitation with Weaning. Pain Medicine 2013;14:1908-1917. ↑ 31.0 31.1 Hooten W.M, Townsend C.O, Sletten C.D, Bruce B.K, Rome J.D. Treatment Outcomes after Multidisciplinary Pain Rehabilitation with Analgesic Medication Withdrawal for Patients with Fibromyalgia. Pain Medicine 2007;8:8-16. ↑ Kahan M, Mailis-gagnon A, Wilson L, Srivastava A. Canadian guideline for safe and effective use of opioids for chronic noncancer pain Clinical summary for family physicians. Part 1: general population. Canadian Family Physician 2011;57:1257-1266. ↑ 34.0 34.1 Reeve E, Shakib S, Hendrix I, Roberts M.S, Wiese M.D. Review of deprescribing processes and development of an evidence based, patient-centred deprescribing process. British Journal of Clinical Pharmacology 2014;78:738–747. ↑ Scott I.A, Hilmer S.N, Reeve E, Potter K, Le Couteur D, Rigby D, Gnjidic D, Del Mar C.B, Roughead E.E, Page A, Jansen J, Martin J.H. Reducing inappropriate polypharmacy: the process of deprescribing. JAMA Internal Medicine 2015;175:827-834. ↑ Belcher V.N, Fried T.R, Agostini J.V, Tinetti M.E. Views of older adults on patient participation in medication-related decision making. Journal of General Internal Medicine 2006;21:298–303. 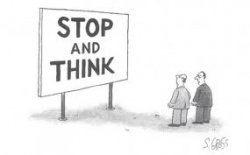 ↑ Levinson W, Kao A, Kuby A, Thisted R. Not all patients want to participate in decision making. Journal of General Internal Medicine 2005;20:531–535. ↑ Steinman M.A. Polypharmacy - time to get beyond numbers. JAMA Internal Medicine 2016;176:482–483. ↑ Reeve E, To J, Hendrix I, Shakib S, Roberts M.S, Wiese M.D. Patient barriers to and enablers of deprescribing: a systematic review. Drugs Aging 2013;30:793–807. ↑ Linsky A, Simon S.R, Bokhour B. Patient perceptions of proactive medication discontinuation. Patient Education and Counseling 2015;98:220–225. ↑ Reeve E, Low L.F, Hilmer S.N. Beliefs and attitudes of older adults and carers about deprescribing of medications. British Journal of General Practice 2016;66:552–60. ↑ Anderson K, Freeman C, Stowasser D, Scott, I. Prescriber barriers and enablers to minimising potentially inappropriate medications in adults: a systematic review and thematic synthesis. BMJ Open 2014;4. ↑ Reeve R, Wiese MD, Hendrix I, Roberts I and Shakib S. People’s attitudes, beliefs, and experiences regarding polypharmacy and wiliness to deprescribe. J Am Geriatr Soc. 2013a Sep; 61(9): 1508-14. ↑ Qi K, Reeve E, Hilmer SN, Pearson SA, Matthews S and Gnjidic, D. Older people’s attitudes regarding polypharmacy, statin use and willingness to have satins deprescribed in Australia. Int J Clin Pharm. 2015 Oct;37(5):949-57. ↑ 49.0 49.1 Kalogianis MJ, Wimmer BC, Turner JP, Tan EC, Emery T, Robson L, et al. Are residents of aged care facilities willing to have their medications deprescribed? Res Social Adm Pharm. 2016 Oct;12(5):784-88. ↑ 50.0 50.1 Reeve E, Low L-F, Shakib S and Hilmer SH. Development and validation of the revised patients’ attitudes towards deprescribing (rPATD) questionnaire: versions for older adults and caregivers. Drugs Aging. 2016b Oct;33(12):913-28. ↑ 51.0 51.1 Reeve E, To J, Hendrix I, Shakib S, Roberts MS and Wiese MD. Patient barriers to and enablers of deprescribing: a systematic review. Drugs Aging. 2013b Oct;10(1):793-807. ↑ 52.0 52.1 Linksy A, Simon SR and Bokhour B. Patient perceptions of proactive medication discontinuation. Patient Educ Couns. 2015 Feb;98(2):220-25. ↑ 53.0 53.1 Reeve E, Low L-F and Hilmer SN. Beliefs and attitudes of older adults and carers about deprescribing of medications: a qualitative focus group study. Br J Gen Pract. 2016a Aug; 66(649):552-60. ↑ 54.0 54.1 Reeve E and Wiese MD. Benefits of deprescribing on patients’ adherence to medications. Int J Clin Pharm. 2014 Feb;36(1):26-9. ↑ 55.0 55.1 55.2 Jokanovic N, Tan ECK, Sudhakaran S, Kirkpatrick CM, Dooley MJ, Ryan-Atwood TE, et al. Pharmacist-led medication review in community settings: an overview of systematic reviews. Res Social Adm Pharm. 2017a Aug;13(4):661-85. ↑ 56.0 56.1 Hajjar E, Cafiero A, Hanlon J. Polypharmacy in elderly patients. The American Journal of Geriatric Pharmacotherapy. 2007;5(4):345-351. ↑ Olsson IN, Runnamo R and Engfeldt P. Medication quality and quality of life in the elderly, a cohort study. Health Qual Life Outcomes. 2011Nov;9(95):1-9. ↑ Jyrkka J, Enlund H, Korhonen MJ, Sulkava R and Hartikainen S. Polypharmacy status as an indicator of mortality in an elderly population. Drugs Aging. 2012 Dec;26(12):1039-48. ↑ Maher RL, Hanlon J and Hajjar ER. Clinical consequences of polypharmacy in elderly. Expert Opin Drug Saf. 2014 Sep;13(1):57-65. ↑ Wallace E, Mcdowell R, Bennett K, Fahey T and Smith SM . Impact of potentially inappropriate prescribing on adverse drug events, health related quality of life and emergency hospital attendance in older people attending general practice: a prospective cohort study. J Gerontol A Biol Sci Med Sci. 2017 Feb;72(2):271-77. ↑ Passarelli MVG, Jacob-Filho W and Figueras A. Adverse drug reactions in an elderly hospitalized population. Drugs Aging. 2005 Sep;22(9):767-77. ↑ 62.0 62.1 Budnitz DS, Lovegrove MC, Shehab N and Richards C. Emergency hospitalizations for adverse drug events in older Americans. N Engl J Med. 2011 Nov;365(21):2002-12. ↑ Reeve E, Andrews JM, and Wiese MD. Feasibility of a patient-centred deprescribing process to reduce inappropriate use of proton pump inhibitors. Ann Pharmacother. 2014 Nov;49(1):29-38. ↑ Mudge A, Radnedge K, Kasper K, Mullins R, Adsett J, RofailS, et al. Effects of a pilot multidisciplinary clinic for frequent attending elderly patients on deprescribing. Aust Health Rev. 2015 Apr;40(1):86-91. ↑ 65.0 65.1 Iyer S, Naganathan V, Mclachlan AJ, and LE Couteur DG. Medication withdrawal trials in people aged 65 years and older: a systematic review. Drugs Aging. 2008 Dec;25(12):1021-31. ↑ Graves T, Hanlon JT, Schmader KE, Landsman PB, Samsa GP, Pieper CF, et al. Adverse events after discontinuing medications in elderly outpatients. Arch Gen Intern Med. 1997 Oct;157(19):2205-10. ↑ Marcum ZA, Pugh MJ, Amuan ME, Handler SM, Ruby CM and Hanlon JT. Prevalence of potentially preventable unplanned hospitalizations caused by therapeutic failures and adverse drug withdrawal events among older veterans. J Gerontol A Biol Sci Med Sci. 2012 Aug;67(8):867-74. ↑ 68.0 68.1 Paquin AM, Zimmerman K, and Rudolph JL. Risk versus risk: a review of benzodiazepine reduction in older adults. Expert Opin Drug Saf. 2014 Jun;13(7):919-34. ↑ Jokanovic N, Tan ECK, Van Der Bosch D, Kirkpatrick CM, Dooley MJ, and Bell JS. Clinical medication review in Australia: a systematic review. Res Social Adm Pharm. 2016 Jun;12(3):384-418. ↑ Williams ME, Pulliams CC, Hunter R, Johnson TM, Owens JE, Kincaid J, et al. The sort-term effect of interdisciplinary medication review on function and cost in elderly people. J Am Geriatr Soc. 2004 Dec;52(1):93-98. ↑ 72.0 72.1 Garfinkel D, Zur-Gil S, and Ben-Israel J. The war against polypharmacy: a new cost-effective geriatric-positive approach for improving drug therapy in disabled elderly people. Isr Med Assoc J. 2007 Jun;9(6):430-34. ↑ 73.0 73.1 Kutner JS, Blatchford PJ, Taylor DH, Ritchie C, Bull JH, Fairclough DL, et al. Safety and benefit of discontinuing statin therapy in the setting of advanced, life-limiting illness: a randomized clinical trial. JAMA Intern Med. 2015 May;175(5):691-700. ↑ Garfinkel D, and Mangin D. Feasibility study of a systematic approach for discontinuation of multiple medications in older adults: addressing polypharmacy. Arch Intern Med. 2010 Oct;18(1):1648-58. ↑ Haastrup P, Paulsen MS, Begtrup L, Hansen JM, and Jarbol DE. Strategies for discontinuation of proton pump inhibitors: a systematic review. Fam Pract. 2014 Sep;31(6):625-30. ↑ Declerq T, Petrovic M, Azermai M, Stichele RV, De Sutter AJ, Van Dreil ML, et al. Withdrawal versus continuation of chronic antipsychotic drugs for behavioural and psychological symptoms in older people with dementia. Cochrane Database Syst Rev. 2013 Mar;(3):1-49. ↑ Holmes HM, Sachs, GA, Shega JW, Hougham GW, Cox HD, Dale W. Integrating palliative medicine into the care of persons with advanced dementia: identifying appropriate medication use. J Am Geriatr Soc. 2008 Jul;56(7):1306-11. ↑ 78.0 78.1 78.2 Jokanovic N, Wang KN, Dooley MJ, Lalic S, Tan ECK, Kirkkpatrick CM, et al. Prioritizing interventions to manage olypharmacy in Australian aged care facilities. Res Social Adm Pharm. 2017b Jun;13(3):564-74. ↑ Budnitz DS, Shehab N, Kegler SR, and Richards CL. Medication use leading to emergency department visits for adverse drug events in older adults. Ann Intern Med. 2007 Dec;147(11):755-65. ↑ Runciman WB, Roughead EE, Semple SJ, and Adams RJ. Adverse drug events and medication errors in Australia. Int J Qual Health Care. 2003 Dec;15(1):49-59. ↑ Freyer G, Geay JF, Touzet S, Provencal J, Weber B, Jacquin JP, et al. Comprehensive geriatric assessment predicts tolerance to chemotherapy and survival in elderly patients with advanced ovarian carcinoma: a GINECO staudy. Ann Oncol. 2005 Nov;16(11):1795-1800. ↑ Turner JP, Shakib S, Hogan-Doran J, Prowse R, John S, and Bell JS. Prevalence and factors associated with polypharmacy in older people with cancer. Support Care Cancer. 2014 Jul;22(7):1727-34. ↑ Sharma M, Loh KP, Nightingake G, Mohile SG, and Holmes HM. Polypharmacy and potentially inappropriate medication use in geriatric oncology. J Geriatr Oncol. 2016 Aug;7(5):346-53. ↑ Senel G, Uysal N, Oguz G, Kaya M, Kadioullari N, Kocak N, et al. Delirium Frequency and risk factors among patients with cancer in palliative care unit. Am J Hosp Palliat Care. 2017 Apr;34(3):282-6. ↑ Gnjidic D, Hilmer SN, Blyth FM, Naganathan V, Waite L, McLachlan AJ, et al. Polypharmacy cutoff and outcomes: five or more medicines were used to identify community-dwelling older men at risk of different adverse outcomes. J Clin Epidemiol. 2012 Sep;65(9):985-95. ↑ Turner JP, Jamsen KM, Shakib S, Singhal N, Prowse R, and Bell JS. Polypharmacy cut-points in older people with cancer: how many medications are too many? Support Care Cancer. 2016 Apr;24(4):1831-40. ↑ Scott IA, Hilmer SN, Reeve E, Potter K, Le Couteur D, Rigby D, et al. Reducing inappropriate polypharmacy: the process of deprescribing. JAMA Intern Med. 2015 May;175(5):827-34. ↑ Farrell B, Richardson L, Raman-Wilms L, Launay DD, Alsabbagh W, and Conklin J. Self-efficacy for deprescribing: a survey for health care professionals using evidence-based deprescribing guidelines. Res Social Adm Pharm. 2018 Jan;14(1):18-25. ↑ Scott I, Hilmer S, Reeve E, Potter K, Le Couteur D, Rigby D et al. Reducing Inappropriate Polypharmacy. JAMA Internal Medicine. 2015;175(5):827. ↑ Scott, I.A., Hilmer, S.N., Reeve, E., et al., 2015. Reducing inappropriate polypharmacy: the process of deprescribing. JAMA Internal Medicine 175 (5), 827–834. ↑ 96.0 96.1 96.2 Braund R, Abbott J. Recommending NSAIDs and paracetamol: A survey of New Zealand physiotherapists' knowledge and behaviours. Physiotherapy Research International. 2011;16(1):43-49. ↑ 98.0 98.1 Kumar S, Grimmer K. Nonsteroidal antiinflammatory drugs (NSAIDs) and physiotherapy management of musculoskeletal conditions: a professional minefield?. Therapeutics and Clinical Risk Management. 2005;1(1):69-76. ↑ Babyak M, Blumenthal J, Herman S, Khatri P, Doraiswamy M, Moore K et al. Exercise Treatment for Major Depression: Maintenance of Therapeutic Benefit at 10 Months. Psychosomatic Medicine. 2000;62(5):633-638. ↑ Blake H. Physical activity and exercise in the treatment of depression. Frontiers in Psychiatry. 2012;3. ↑ Blumenthal J, Smith P, Hoffman B. Is Exercise a Viable Treatment for Depression?. ACSM's Health & Fitness Journal. 2012;16(4):14-21. ↑ Ruxton K, Woodman R, Mangoni, A. Drugs with anticholinergic effects and cognitive impairment, falls and all‐cause mortality in older adults: A systematic review and meta‐analysis. British Journal of Clinical Pharmacology. 2015; 80(2):209-220. ↑ 111.0 111.1 111.2 Tamminga C. When Is Polypharmacy an Advantage?. American Journal of Psychiatry. 2011;168(7):663-663. ↑ 112.0 112.1 Kwan D, Farrel B. Polypharmacy—optimizing medication use in elderly patients. Pharm Pract. 2012;29(2):20-25. ↑ Viktil K, Blix H, Moger T, Reikvam A. Polypharmacy as commonly defined is an indicator of limited value in the assessment of drug-related problems. British Journal of Clinical Pharmacology. 2007;63(2):187-195. ↑ Malhotra S, Karan R, Pandhi P, Jain S. Drug related medical emergencies in the elderly: role of adverse drug reactions and non-compliance. Postgraduate Medical Journal. 2001;77(913):703-707. ↑ Gómez C, Vega-Quiroga S, Bermejo-Pareja F, Medrano M, Louis E, Benito-León J. Polypharmacy in the Elderly: A Marker of Increased Risk of Mortality in a Population-Based Prospective Study (NEDICES). Gerontology. 2014;61(4):301-309. ↑ Sergi G, De Rui M, Sarti S, Manzato E. Polypharmacy in the Elderly. Drugs & Aging. 2011;28(7):509-519. ↑ Kukreja S, Kalra G, Shah N, Shrivastava A. Polypharmacy in psychiatry: A review. Mens Sana Monographs. 2013;11(1):82. ↑ 118.0 118.1 118.2 118.3 118.4 Hanlon P, Nicholl B, Jani B, McQueenie R, Lee D, Gallacher K et al. Examining patterns of multimorbidity, polypharmacy and risk of adverse drug reactions in chronic obstructive pulmonary disease: a cross-sectional UK Biobank study. BMJ Open. 2018;8(1):e018404. ↑ 119.0 119.1 White P, Thornton H, Pinnock H, Georgopoulou S, Booth H. Overtreatment of COPD with Inhaled Corticosteroids - Implications for Safety and Costs: Cross-Sectional Observational Study. PLoS ONE. 2013;8(10):e75221. ↑ 120.0 120.1 120.2 Grousse L. Selective polypharmacy for chronic obstructive pulmonary disease. Journal of Thoracic Disease. 2014;7(3):E16-E17. ↑ Teichert M, Schermer T, van den Nieuwenhof L, De Smet P, Wensing M. Prevalence of inappropriate prescribing of inhaled corticosteroids for respiratory tract infections in the Netherlands: a retrospective cohort study. npj Primary Care Respiratory Medicine. 2014;24(1). ↑ Gonzalez A, Coulombe J, Ernst P, Suissa S. Long-term Use of Inhaled Corticosteroids in COPD and the Risk of Fracture. Chest. 2018;153(2):321-328. ↑ 124.0 124.1 124.2 Becker W.C, Dorflinger L, Edmond S.N, Islam L, Heapy A.A, Fraenkel L. Barriers and facilitators to use of non-pharmacological treatments in chronic pain. BMC Family Practice 2017;18 [online] [viewed 18/04/2018]. Available from: http://doi.org/10.1186/s12875-017-0608-2.